was first reported in the United States over 100 years ago and the first case in cats was in the 1920’s. Since then it has become a worldwide problem and has spread extensively throughout the USA and in specific areas in Canada: Okanoga Valley in BC, around Winnipeg and Montreal and throughout Southern Ontario (the biggest area in Canada). May is Heartworm prevention month at Beechwood Animal Hospital. During this period our veterinary diagnostics lab, IDEXX, offers discounts for wellness panels that are combined with heartworm testing. We pass these savings onto you, making it more affordable to have your pet’s general health and heartworm status assessed. We have recently deviated from the common veterinary practice of testing for heartworm disease regularly in animals who are taking heartworm prophylaxis (prevention). There are a number of reasons to retest, but we believe that if initial testing is done 2 -3 years in a row (usually 2), and your pet stays on appropriate medication seasonally, then the risk of missing heartworm infection in your pet is slim to none. 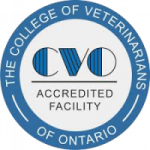 This protocol takes into account the life cycle of the heartworm as well as prevalence here in Ottawa. For more information and statistics on Heartworm disease in Canada please visit Pet Disease Report or Companion Animal Parasite Council. Additional information can be found in our website by typing Heartworm in the search bar.